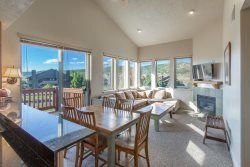 Crestview Condo completed in 2002 - boasts peaceful surroundings, scenic views of the High Ute Ranch, and modern amenities. This spacious corner unit sleeps 8 people in beds. The condo has 2 bedrooms, plus loft and 3 full bathrooms. It's located on the third (top) floor of an elevator building. Enjoy the serenity of your surroundings without the noise of neighbors. The condo features a large, private deck with a gas grill. Crestview is a secure building with indoor parking with assigned spaces. You're minutes from The Canyons (3 mins), Park City Mountain Resort (6 mins), and Deer Valley (7 mins.) Alta, Snowbird, Solitude, and Brighton are all less than an hour away. Don't waste your money on ski-in ski-out and get stuck at one resort. The Tanger Outlet shopping center is right down the street. • Standard check-in and check-out is 3PM and 10AM - We try to accommodate special requests. • The condo you booked is the one you will get. • Pricing does not include 10.17% Park City Lodging tax. • Pricing does not include a $150 cleaning fee. • We are keyless, a door key code will be generated for self check-in. • There is one assigned parking spot in the garage, there is plenty of outside parking. • All of our condos have in unit washer/dryer, BBQ grills, full kitchens and Internet. • We accept Visa, Mastercard, Discover, Check, Money Order and Paypal. • Rental deposit is 50% immediately and the other 50% 30 days before check-in. Let us know when you are ready to book and we will send you a link.